Over the August school holidays most families set off in search of mountains to ski and it is truly the month of snow and biting southerlies courtesy of the magnificent land mass of southern Antarctica. Sadly it doesn't snow here in Wellington as we are situated on the coast and it just not cold enough for much other than pelting hail...Snow is elusive. Although I say that and up above the surrounding high hills that encircle Wellington region snow settles and the walks around Eastbourne where I live the vistas of snow capped hills is a delight to behold. Magic even! So this artwork is inspired by the all the snow we have had in our country and my absolute love of the beautiful but fragile blooms of Camellia bushes. Nick- named the winter rose they adorn most gardens with an abundance of flowering petals. Colours range from the darkest red through to candy pinks with bright yellow stamens, palest pink and opalescent whites. I love them for their bravery. Against the onslaught winter weather they endure as much as they can and then they bruise and whole heads tumble onto grass and footpaths. I admire their resilience. 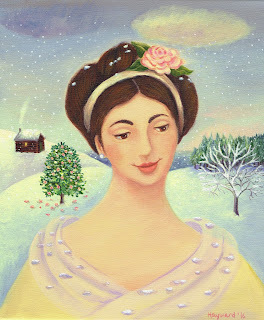 My Camellia in this artwork loves the snow, she is not afraid for she filled with peaceful love knowing although she may bruise she will survive to bloom again next winter!